Is there a tipping point when it comes to having too much of a good thing? Will DC diners tire of new Italian restaurants considering that we’ve recently gained Ghibellina, Etto, Osteria Morini, Alba Osteria, Fiola Mare, and now Lupo Verde? Will 14th Street, bursting-at-the-seams with new restaurants, eventually start to see some attrition? We will have to watch and see what happens. My guess is that answers may lie in quality and not quantity. I make two visits to Lupo Verde, DC’s newest Italian kid on the block, within a week. My first visit is a small media dinner. I head back a few days later with friends, because there is much about this restaurant that leaves me wanting more. Lupo Verde (which translates to green wolf) is brought to us by Antonio Matarazzo and Med Lahlou, owners of Ulah Bistro, Tunnicliff’s Tavern, and Station 4. The restaurant features a formidable selection of cheese and charcuterie, along with pastas, pizzas, and mains inspired by Matarazzo’s hometown in the Campania region of southern Italy. One distinguishing factor, and an emerging trend, is that the restaurant also doubles as a shop. The cheese, charcuterie, and a majority of menu items will be available for take-out. There’s something so appealing to me about the ability to dine out and shop simultaneously. Corporate chef Orlando Amaro oversees the menu, alongside chef de cuisine Domenico Apollaro, who has moved from Italy to D.C. to work at Lupo Verde. Lupo Verde’s rustic Italian cuisine features some familiar dishes (li.e. lasagna, carbonaro, bruschetta) with some that are out-of-the-ordinary. Breaded testa (head cheese) anyone? I am initially reluctant to try the dish, but once I get past the idea of eating something from the head of a pig, I admit that it’s quite good. It’s certainly not the first time I’ve ventured into pig head territory, but I always seem to need a bit of coaxing before diving in. Octopus on an Italian menu is de rigueur these days. (Pardon my French.) Lupo Verde’s version comes with farro salad. 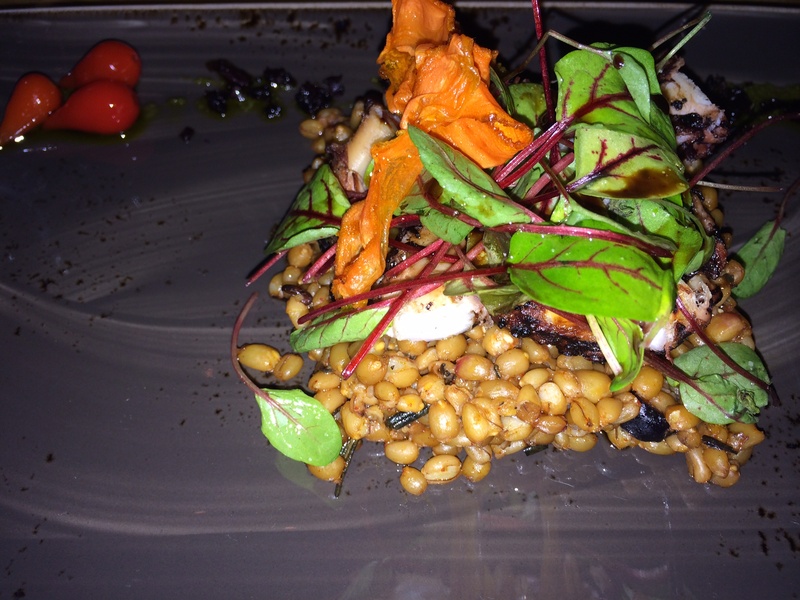 The octopus is integrated nicely into the dish, and the farro adds a pleasant earthiness. Extra points for presentation. Homemade striglie (pasta) is laced with lamb ragu, polpette, and ricotta salata. After sampling a number of dishes on the menu, this one is memorable for its rich and complex flavors – perfect for a winter night. This is on my list for a future visit. 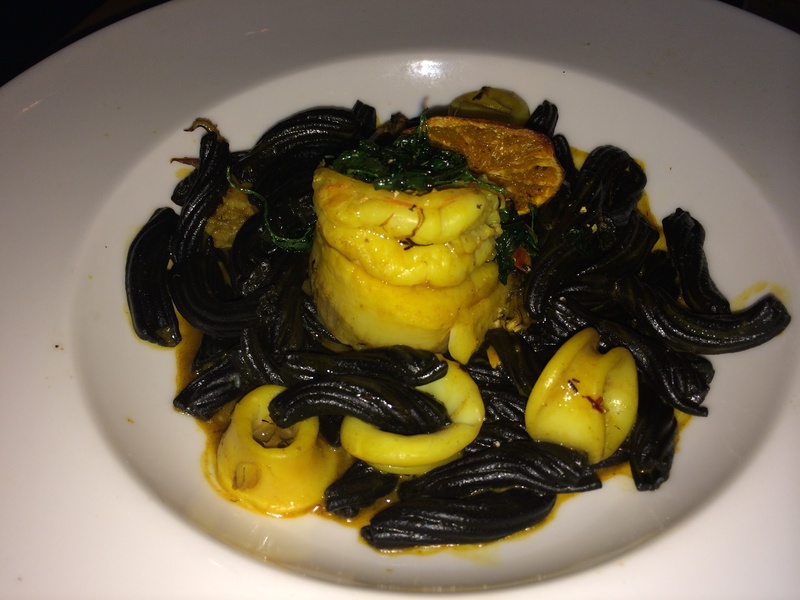 Garganelli al Nero features squid ink pasta with shrimp, scallop, and calamari in a saffron broth. The rough-hewn house made pasta has just the right amount of chew. The fish-infused broth has a mere hint of heat, which allows the seafood flavors to shine. I find the dish noteworthy on my first visit, but it suffers from over-salting the second time around. Lupo Verde’s pizza is a plus. 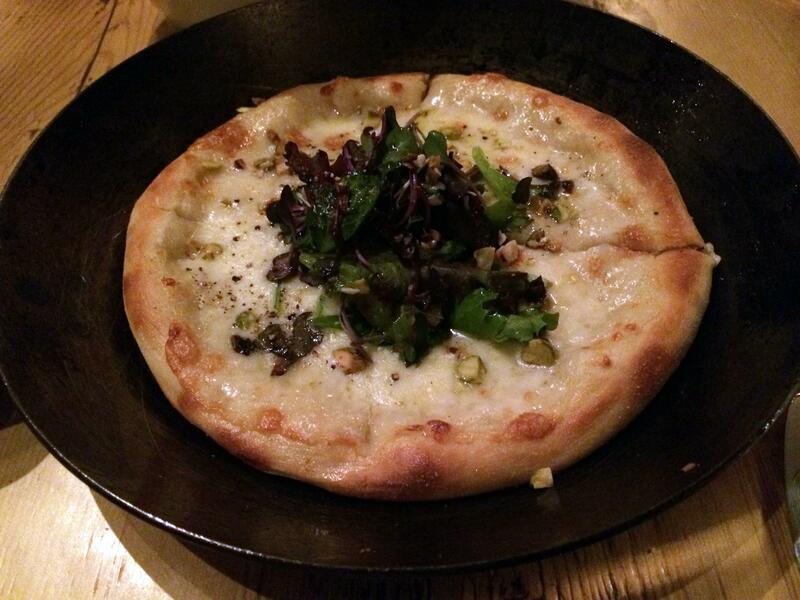 RA2 features mozzarella, stracchino, pistachio, radicchio, and honey. The pistachio adds a pleasant and unique crunch.The RA2 is intended to have mortadella, which we omit on both visits. I imagine it to be a worthy addition. I love the idea of honey on pizza, but find it to be a little subtle. A bit more honey, please. Lupo Verde has a wide and varied menu to suit any diner’s tastes and moods. In my opinion, there is one must have. Do not miss out on Coppa del Nonna for dessert. 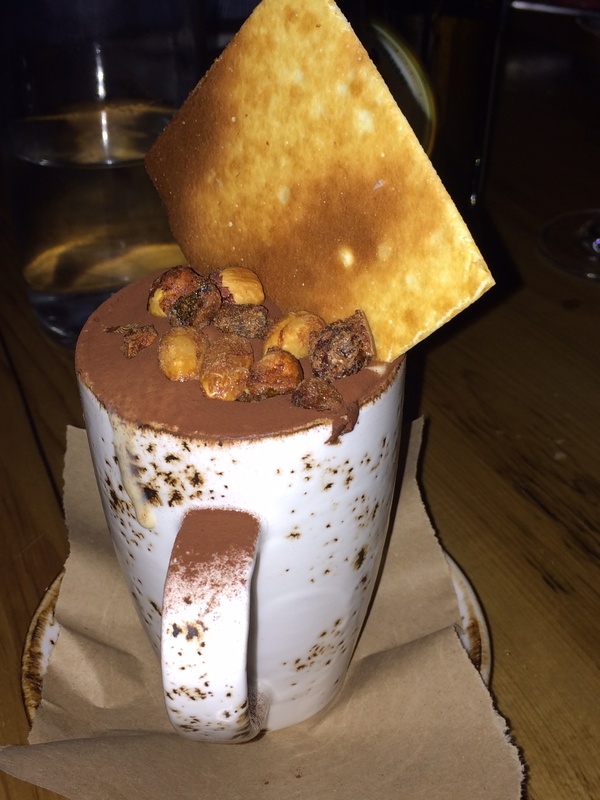 This coffee and chocolate semifreddo features Nutella and coffee gelato. I actually despise hazelnuts, and yet I could not resist dipping into this cool concoction again and again. It looks like hot chocolate, but is instead a light and creamy semi-frozen mousse with a layer of Nutella that is only unveiled as you continue to dig deeper into the ceramic mug. A menu highlight for sure. Lupo Verde has a convivial atmosphere that evokes a true Italian cucina and bar, and a multi-faceted menu that encourages guests to linger. While the restaurant is only days old, it is already drawing impressive crowds. My second visit to Lupo Verde suffers from the restaurant’s early success. We have a 7:30 reservation for a party of eight. Forty-five minutes later there is still no table available. It’s a Sunday night, my friends are hungry, and getting understandably crankier with each passing minute. They end up bailing. Once I have my mind set on a particular restaurant, it’s impossible to tear me away, so my husband and I hang on. While the staff couldn’t have been more apologetic, it is hard for us to recover and fully enjoy the meal. The owner explains that they are still tinkering with the timing on reservations, as guests are staying longer than initially expected. As with any brand new restaurant, there are kinks to work out. While 14th Street doesn’t need another restaurant, it’s breadth is deepened with the addition of Lupo Verde. I expect that someday it will be known as the old Italian kid on the block.